A crisp, clear photograph is often taken at face value—it is what it is. Often there is little room for the viewer’s imagination to play with possibilities, or embark on a new way of seeing. Within each of us lies a curiosity, and a desire to find novel ways of perceiving the world. I seek to spark my viewer’s creativity. I do this by experimenting with uncertainty with my images. This means stretching beyond the dictates of “established good photography,” by discarding the clear focus of the camera lens. It may mean using the instrument in my hands, in ways that some say, the camera was not intended. Yet, the history of photography is rich with photographers who experimented with the camera’s unique ability to portray the world in novel ways. Author Lyle Rexer, in his book The Edge of Vision: The Rise of Abstraction in Photography states that from its earliest beginnings photography has always been about experiments, revisions, and happy accidents. It‘s visionaries—too many to name here and better left for the book– purposely pushed the boundaries in their photographs to explore metaphors beyond what is literally seen. Many sought a connection with the eternal and transcendent forces at work in the universe. I am inspired by these predecessors. Since my subject matter is nature with its own realistic allure, the question becomes how to create unique and compelling compositions which touch a viewer’s inner being? Poetry can offer a clue. Often lyrical and expressive, compelling poetry offers a mysterious mood or unspoken scenario to contemplate. Verses are suggestive; offering just enough of what is real as a touchstone. Like a poem, I leave the fleeting impression of the real botanic form in my photographs. I seek to evoke a change in perception, a meditative awareness, a reconsideration of the dream of ourselves, or that which appears to be. I want my viewer to linger a bit and interpret a naturescape in a deeper, more personal way. Nature provides us with an infinite source of refreshment and wonder. Perhaps the inferred shape of a leaf filled with color and light, or a quiet revelation of grace will connect a viewer to that greater whole. 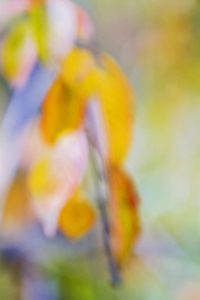 I endeavor to capture the unseen magic behind the scenes in gardens, prairies, and forests. Hopefully my photography will encourage a moment for reflection, an unfolding mystery to discover, with a deepening sense of well- being for all.